Nestled in Johannesburg is The Orbit, a sit-down, swanky cocktail affair, complete with an equally classy jazz band. A grand piano, saxophone, drum kit and five string bass were fronted by a lady dressed in a sophisticated all-black velvet jumpsuit, centre-stage, playing the flute: Kamogelo Matsoso. This opening tune was a taste of the class and elegance that only Matsoso could emanate; looking graceful and beautiful and speaking articulately, clearly and passionately. 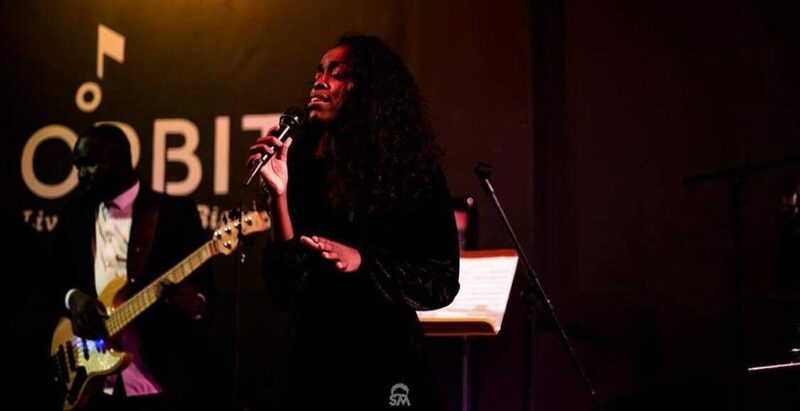 A night of stunning musical compositions was ornamented with tasteful and tactical solos, all to support the stunning melismatic, rolling voice of Matsoso. Touching on R&B with her vocal range and the smoothness from which the notes blend, the music was immediately gratifying, often hitting notes that made the hairs on your arms stand to attention. Vocals, sax, keys and drums were all in perfect jazz harmony. A song with backing singers, sung in a cappella in a three-part harmony, silenced the awed room. Matsoso reminded us of many things, such as picking yourself up – “flying and being yourself, coming into yourself” – which evidently links to the title of her art series: Coming of Age . Not only did Matsoso empower femininity, but she also empowered her origins as an African woman as she gave an ode to ‘Ke Mo Afrika’ by Maleh and proceeded to sing a song in the ‘click language’, which she impressively executed in perfect time with the rim shot on the drums. The overall effect was enthralling. Throughout the entire set, not one beat was missed: each note was executed to polished perfection. I could have been in any high-class jazz establishment the world over, but Matsoso brings Africa to the audience in her vocals, lyrics and delivery: a nod to her heritage, culture and musical divinity.